While the House’s recent passage of the American Health Care Act threatens to put millions of lives in jeopardy for the sake of pure spite, at least those it threatens will always have the healing salve of laughter, which is one of the few medicines still available to everyone under the Republicans’ plan. 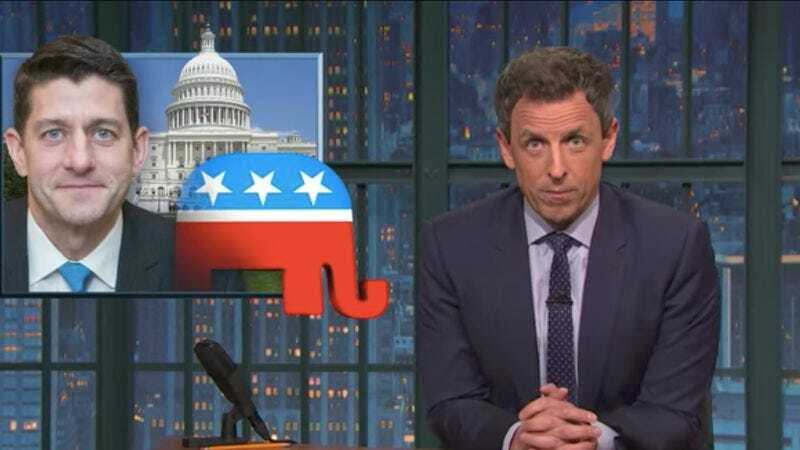 Emboldened by the growing national sentiment that letting poor people die is bad, late-night comedians have been eagerly taking apart the bill and its backers lately, from Jimmy Kimmel to Stephen Colbert to the late Tom Snyder, probably, so obvious are their flaws. It’s the sort of needling criticism that, were you one of those Republican leaders, you might just ignore, like a town hall filled with angry constituents. But of course, that would require some sort of understanding of how to prevent further human suffering. So naturally, Speaker Paul Ryan’s office sent an email to Late Night host Seth Meyers. They took issue with our characterization of the bill as rushed, writing, “This bill has been online for a month, went through four House committees, and the only change this week was a simple three-page amendment.” Which is misleading for a number of reasons. For one thing, that three-page amendment is the reason a lot of Republicans changed their mind and voted for this bill, so you can’t claim it’s a small change. A lot can happen in three pages. That’s like saying, “I made you a cappuccino with hot water, sugar, espresso, and one other ingredient.” You would say, “Well, what’s the other ingredient, Mr. Cosby? From there, Meyers illustrated how the current pack of political mercenaries is so blinded by partisan bloodlust that even Lindsay Graham has emerged as a voice of reason, explained how the new plan mostly provides tax cuts for the exorbitantly wealthy, and countered Ryan’s typically weaselly defense of the repeal of mandates protecting pre-existing conditions. He also invited Paul Ryan to come and appear on his show to discuss the bill in person—a debate that, if Ryan were to accept, would surely prove just as ameliorating as having a working, compassionate health care system. As cancer ravages your body, at least you’ll have all these great late-night segments to watch.